The snubnose revolver is a close-quarters self-defense handgun. The design was a response to the need for a compact repeating handgun which could be presented rapidly and concealed easily. The first compact revolvers were not the double action hand ejector revolvers we think of as snubnoses today. Colt, Smith & Wesson and others were building small revolvers from the 1850s on. Both Colt and Smith & Wesson introduced double action revolvers in 1877. 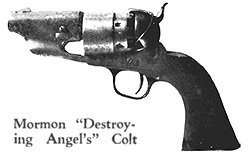 The S&W guns were top break designs and the Colts were side-loaders. In 1894 Smith & Wesson introduced the hand ejector design, the cylinder mounted on a crane which swings out for loading and unloading, with the push rod and ejector star to eject the spent cases. 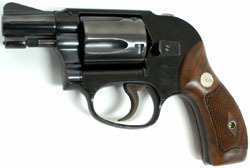 With the development of hand ejector, the modern double-action snubnose footprint was pretty much established, leaving only the final touch, the sawed-off barrel to Colt. By 1927, Colt had produced its six-shot Detective Special based on their .38 Police Positive Special. Its entirely possible that the very first snubnose may have been a home-brew full sized revolver with its barrel sawed off. Well never know for sure. In 1942 Smith & Wesson built a few Victory Model Military & Police revolvers with 2″ barrels. In 1946, they began commercial production of the pre-Model 10 (Military & Police) snubnose. 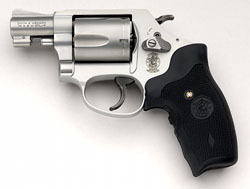 In 1950, Smith & Wesson introduced the 5-shot J-frame Chiefs Special in .38 Special. 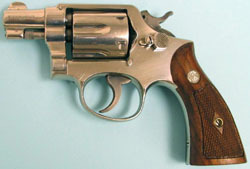 It was much more compact than previous renditions of the snubnose, and it has become the archetype for compact revolvers. It remains in service and production to this day. 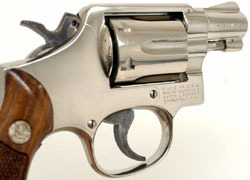 Sadly, the Colt Detective Special and the Cobra (Detective Special with a Coltalloy frame) are no longer in production. The Model 10 snubnose is no longer in production either. What we do know is that the snubnose emerged in the shadow of full sized service revolvers like the Colt Single Action Army, The Remington New Army, and the Smith & Wesson Schofield. These were large and powerful single action revolvers chambered in .44 or .45 with 4, 6 and 8 inch barrels. These large revolvers were replaced by equally large double action Colt New Service and the Smith & Wesson Military and Police revolvers. These guns had long barrels and full grips. With six and eight inch barrels, they produced respectable muzzle velocity and superb accuracy. So what would be the rationale for sawing off the barrel and grips, and thereby reducing the sight radius, muzzle velocity and general controllability of a handgun? We always talk about the conceal-ability of the snubnose how easy it is to carry and conceal in a pocket or purse, and this is true, but there is another reason for building a short barreled revolver, and that is speed. If you have ever actually strapped on a Colt Single Action Army six-shooter, drawn that gun and fired it, you will understand that this operation is not all that easy to do quickly. These guns are heavy and the long barrels have to be hoisted high to clear the leather. Now, I have seen guys like Bob Munden do amazing quick draw tricks with Colt SAAs, but even Bobs guns are 4 models, and Bob is a natural phenomenon. For the rest of us mere mortals, drawing a full sized revolver and getting its sights on target is a slow affair. Try it for yourself if you have the equipment: draw a 6 barreled revolver from a holster, and then put a snubnose in the same holster, and see how much faster and easier you clear the leather with the snubby. There’s just less distance to travel, and therefore, less time involved. The second and perhaps most enduring glory of the snubnose is its ability to be easily concealed. When rendered with modern light weight metallurgy, you get a handgun that still ranks as one of the best combinations of reliability, power and comfort in carry of any handgun ever built. The snub-nose .38 Special is a study in trade-offs. The .38 Special is an excellent cartridge coming out of a 4″ barrel. Launched from a 2″ barrel, it can suffer velocity and expansion problems. On the other hand, a .38 with a 4″ barrel wont fit in your pocket. A snub-nose .38 can launch a bigger bullet than any other pistol of its size and weight, a 158 grain slug, but it can only launch five or six of them before you have to reload. Its small size and weight make it a dream to carry, but a pain to shoot. Modern .38 Special +p ammunition from Federal, Remington, Speer, Cor-Bon and Winchester has addressed the velocity and expansion issues fairly well. Nevertheless, when you select the snubby as a self-defense handgun, you have to come to grips with the compromises involved with them. (Well, duh, I hear you say.) The fact of the matter is that most people don’t practice much with their carry guns. When we go to the range or matches, we engage our egos and shoot the big full-sized guns with their long barrels and superb triggers, but then, when we leave the range, the gun on our hip is some little compact revolver or auto. As Walt Rausch is fond of saying, We talk .45s, shoot 9mms and carry .38s. The big gun gets 300 rounds and the carry gun gets 10. This is really backwards. Shouldn’t the gun you bet your life on get the lions share of the practice? When was the last time that you actually did an IDPA match with a J-frame revolver? If you haven’t, you should. Its enlightening. Can you empty your snubnose into a pie plate at seven yards in five seconds? If you cant, you need to go back to the range and pop caps until you can. (And that’s five seconds drawing from realistic concealment) Can you do that while moving to cover? Can you hit anything with a snub gun weak hand only? I think you get my drift. Treat the carry gun realistically, because its the one that’s most likely to pull your bacon out of the fire. Most times these days, when I go to a match, I’m running a Springfield XD-9 with 16 round magazines. I never have to reload unless I want to. Snubbies aren’t like that. My greatest complaint with the snubby is that it only loads five or six rounds. For the most part, you shoot 5 rounds and then have to reload. Can you reload your revolver under stress? Have you ever tried it? While it is true that most civilian self-defense encounters are resolved with 5 rounds or less, with my luck, Ill run into the four zombies from Hell, and if I survive the opening salvo, I will need to reload. Practice your reload until its smooth and fast. It can be done. I’ve watched Jerry Miculek shoot, and he can reload a revolver faster than most of us can reload an auto. (For that matter, Miculek can reload a revolver faster than most of us can do anything.) For the video of Jerry Miculek shooting the world record and reloading, click the play button on the player to the right. Five rounds may not be enough, although it probably will be. I always carry a reload. Its usually a speedloader in my strong-hand pocket. Often I will carry a second speedloader in a pouch on my belt. When everything else is equal, more ammo is better than less. Work out the way you’re going to carry your reload and then practice actually using it. The chances are good that you will discover little screw-ups and problems with your reload procedure that only practice at speed will reveal. Ill share with you a big one: many of the grips that Smith & Wesson put on their J-frames are not properly relieved to handle speedloaders smoothly. Hogue Monogrips and Crimson Trace Laser Grips are relieved properly for speedloaders, but the default Uncle Mikes boot grips and Uncle Mikes Combat Grips are not relieved properly for speedloaders. If the reload defeats you, consider carrying a second gun. In gunfighter parlance, this is referred to as The New York Reload, and its faster than any other kind of reload. 4. Study and understand ammo performance in short barreled revolvers. This is an important point. When a gun fires, the powder is not burned instantaneously. It continues to burn as long as the bullet is traveling down the barrel, and the longer it burns, the more pressure it develops. More pressure means greater muzzle velocity for the bullet. Greater velocity means better hollowpoint performance and terminal ballistics. The snubnose has a very short barrel so you need an ammo which burns its powder fast and develops some velocity. Know also that .38 Special revolvers are calibrated to 158 grain ammunition, and smaller faster loads will tend to shoot low because the bullet emerges from the barrel sooner in the recoil cycle of the gun. Some of our preferred loads include Remington Golden Saber +p, Speer 135 grain +p, and Cor-Bon 110 grain DPX. See also Snubby .38 Special Ballistics. I’m a Cooperite and I believe in aimed fire. At the same time, when you are threatened and drawing at close range, you probably will not have time to align the sights and fire that way. You will whip the gun up, looking over the top of the gun, maybe get the front sight on the target, and pull the trigger. One study I saw showed that most police officers tended to actually use the point shooting technique when under close-range attack. They aren’t trained that way; its just something we do under the stress of a close-in lethal assault. Also, once we cross the age of 50, few of us have the eyes of a 21-year-old fighter pilot. We may not have the visual acuity to see the sights in an emergency. Hence, while I believe that the sighted fire method is to be preferred, we may face self-defense situations which will preclude the use of it. Practice both. The snubnose indexes naturally, almost as if it were an extension of your hand. Being light, and compact, it draws easily and rapidly. I would hazard the guess that there are more snubnose .38 Special revolvers currently deployed for the purpose of self-defense than any other single type of firearm. They are simple and effective. They continue to work, so people continue to use them. The cartridge is powerful enough to be lethal when adequate hits are made, and the ammunition is readily available all over the world. Women and non-dedicated personnel like them. Better a .38 Special in your pocket than a 1911 .45 at home in a dresser drawer. The snubnose is simple and uncomplicated. There are no safeties to remember. There is no complex manual of arms to master and commit to muscle memory. Its point and click. I prefer revolvers for the home defense role because there is no confusion about them. I know that every member of the family has practiced with them, and there are no tricky safety sequences to explain. I have more holsters for my snubnoses than any other firearm platform. I have more hours carrying the snubnose than any other gun. Why? Because they carry so well. An Airweight Smith & Wesson snubnose is the most comfortable gun to carry of any I have ever tried. They are light and ergonomic. A J-frame fits to the human body better than most autoloaders. Autoloaders tend to be blocky and square. The extra magazine also adds weight and bulk. 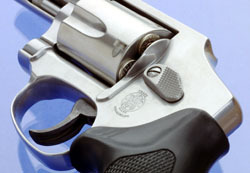 The snubnose is a bit wider at the cylinder than a 1911, but everywhere else, it is thinner and more rounded. They’re just comfortable, and they’re light. An Airweight snub weighs about 15 ounces empty, whereas an empty Government Model M1911 weighs 39 ounces. The conceal-ability of the snubnose also contributes to its speed. You can carry the gun in the pocket of a jacket and have your hand on the grip without anyone noticing it. You can even fire the gun from inside a pocket if you have to, although I don’t recommend that technique. Even so, its a lot quicker than drawing from a holster. Snubbies fit in purses, fanny packs, leg and shoulder holsters, pants pockets and belly bands. Don’t neglect conventional belt holsters and IWBs. A lightweight snub gun in a belt holster is a delight to carry. It is possible to jam a revolver. It is possible, but highly unlikely. I have been firing revolvers for going on 40 years, and I have yet to have one jam on me. (Generally, my autoloaders don’t jam on me either, but it has happened.) How can one jam a revolver? Mostly, it has to do with crud. If crud gets under the ejector star, it can cause the revolver to seize up when the cylinder is closed. Crud build-up on the front of the cylinder and rear of the barrel can cause the cylinder to stop turning. With very light-framed guns using lead bullet +p ammunition, the bullets can pull out of the cases during recoil and cause a jam (Always use jacketed hollowpoints in lightweight snubs), and last, the lock work in the gun can get messed up and cause the gun to fail to fire. All of these failures are very rare. Mostly, revolvers just work with almost monotonous reliability. If you can pull the trigger on a revolver, it will go off, regardless of whether you support it well or not. It doesn’t care about ammo much. It will fire and advance the next cartridge to the firing position. If you are weak or injured, the revolver will still work for you. The other learning at this point is the revolvers are not zero maintenance. They should be fired, cleaned and periodically checked out by a qualified gunsmith. A gun writer whose name is regrettably lost in the crevasses of my faulty memory, once wrote an article about self defense handguns for hiking. He talked about the standard range of handguns from .22s to .44s, but the thing I remember about the article was that he related that on the two occasions in which he actually had to use a gun for self defense, the gun was a .38 Special snubnose. The reason? Because that’s what I had with me. The snubnose .38, and especially the lightweight models such as the S&W Airweight, remain, in my mind, the most comfortable guns to carry and the most versatile in carry modes. Since they are so easy to carry, you’re more likely to have one with you when you need it. Far from being obsolete, the snubnose revolver remains one of the most important, versatile and utilitarian options for self-defense.